I was not expecting to walk in and see this when Reagan was crying in her room when she was supposed to be sleeping. Just 2 days after she learned pull herself up she was doing this. Not what I was hoping to have happen. Nap time is so much harder now. 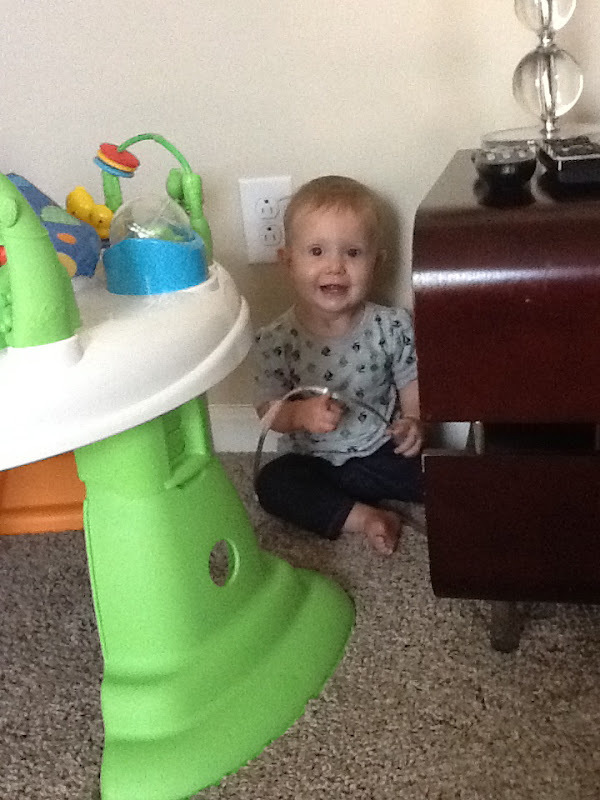 She loves finding the smallest spaces and hiding there and this time pulling out cords from the wall. One of her favorites thing and my least favorite thing. But you can't get mad at that face. One longing to come in and the other to go out. She thinks it is the coolest to stand up on everything now. Still crawls like an inch room and then stands up and goes to the next place. I have started having Camryn nap again and it is has changed both our lives. It is a power struggle for 20 minutes but it is worth it every time. Apparently she was just sleep deprived and that is why is got so naughty during this time of day almost everyday. Mother's Day I got this in bed. The yummy strawberries we picked and an amazing cinnamon roll. I have finally put my finger on why breakfast in bed is so great. It isn't necessarily the eating in bed-that Ryan wouldn't be able to handle-it is the not having to get out of your cozy bed to make anything and especially not having to get your kids their food first. Amazing. Ryan has gotten so good at making focaccia bread and I am so happy about it. Fresh baked bread-nothing better. Not having to make dinner is right up there with the breakfast in bed. I just wanted to be pampered on Mother's Day and I was with Crusted Chicken with Poppy Seeds, rice, asparagus and that bread! And of course brownies and ice cream for dessert. I also got to have Camryn sing for me in Sacrament metting (her first time) and it was so cute, then the RS hour we got this amazing spread for brunch made by the men. All I need. 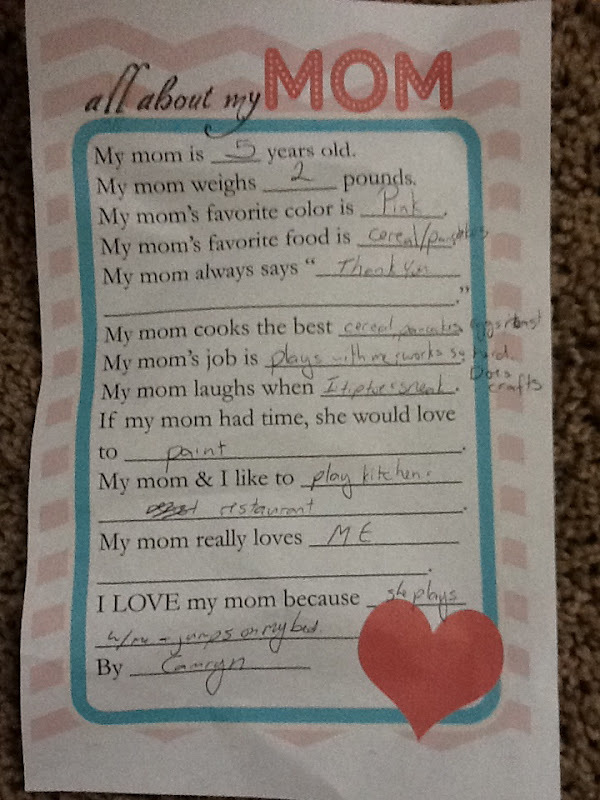 Well that and cute things said by your kids. Love this stuff. Really think that Mother's Day is starting to be my favorite holiday. Wish it were once a month. Sweet baby girl is growing up too fast. Ryan is getting to be quite the cook. 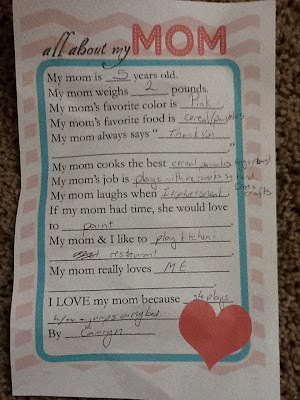 Fun that he teaches Camryn how to spoil you on mothers day. You deserve it. Yes teach me to make that yummy bread - or just make me some! Looks like you had the Mother's Day you deserved. I'm dying to meet Reagan, she is a cute standing up dolly.